As we sat outside with friends last evening with spring surrounding us, the conversation turned to birds. Mary Ann recently saw and photographed a special “triple” here in the Texas hill country: a painted bunting, an indigo bunting, and a lazuli bunting. I would love to see all three of these gorgeous birds together. We chuckled that it’s a sure sign we’re getting older that we’re so interested in watching birds now. I think that’s how Mary Ann felt when she spotted the buntings. It’s how I feel when I listen to the descending songs of canyon wrens, when I watch a golden-fronted woodpecker land in the Spanish oak tree near the garage, and when I spot the bobbing flight of a vermilion flycatcher along the creek. Can you imagine days without birdsong? One of the secret glories of a February bike ride with my husband in Baja California Sur, Mexico, was the sight of a roadrunner crossing the singletrack “Quail Trail” just in front of me. No–not the one pictured at the top of this page, who approached us at our campsite at Catalina State Park in Arizona a couple of years ago. 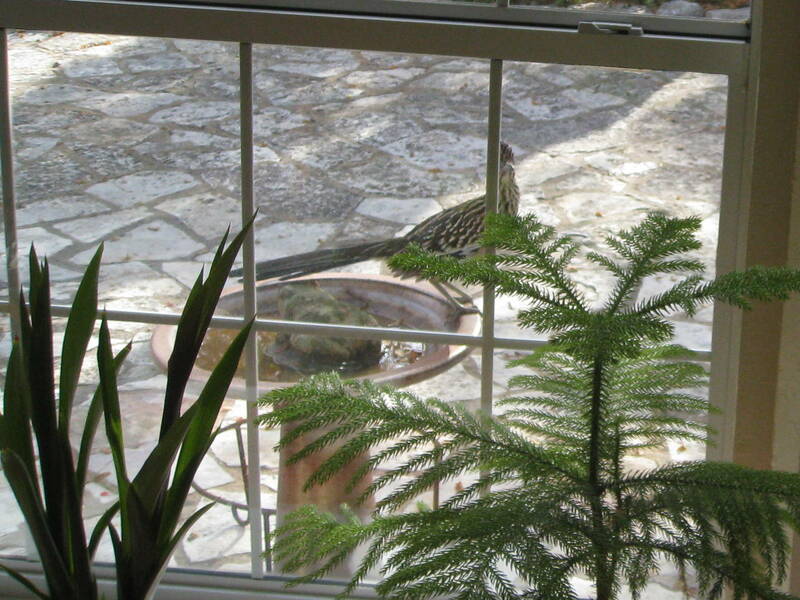 And not this one either, shown below, who perched on the birdbath and peered at me through the window of our dining room at home one morning in 2011. February’s Mexican roadrunner was too quick for cameras, one who showed himself only to me, one I considered to be one of the day’s ordinary miracles. And one which I believe Thoreau would have counted as an honor. Have you felt honored by something as Thoreau was by the bird lighting on his shoulder? What things do you pay more attention to now than when you were another age? This entry was posted in awareness, Baja, birds, gratitude, ordinary miracles, secret glories, Texas hill country. Bookmark the permalink. This brought tears to my eyes, Linda. What a beautiful tribute to nature! On a snorkel/sail trip in Maui, our boat was surrounded by a huge pod of spinner dolphins–jumping, playing, and spinning in the surf. The boat captain turned off the engine and let us drift and enjoy the show until the dolphins left us. I didn’t have a camera and I’m glad, because the memory is one of my favorites. I felt so lucky. Rachel, thank you so much for reading and for sharing your own moment of being touched by wonderful creatures. Your trip sounds magical. Blessings to you and your lovely family, dear friend.